Incepted in the year 1964, at Pune (Maharashtra, India), we, Sadhana Arts, are one of the well-recognized manufacturers, exporters and suppliers of a comprehensive assortment of Metal Name Plates, Metal Labels, Sign Boards, etc. In our product range, we provide Stainless Steel Scales, Metal Tokens, Stainless Steel Name Plates, Brass Name Plates, Aluminium Ano-Etched Labels, Aluminium Anodized Labels, Stainless Steel Sign Boards, etc. Our offered product range is fabricated by our experienced professionals using high grade raw material and sophisticated technology at our well-established manufacturing unit. Apart from this, these products are in complete compliance with the international quality standards. These products are widely acclaimed by our esteemed clients for their high durability, excellent finish, smooth texture and ability to withstand varied conditions. In addition to this, the offered products can also be availed by clients from us in variegated sizes, prints, colors, designs and patterns. 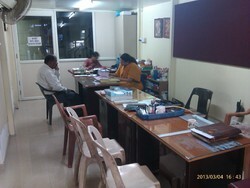 Also, these can be availed in varied customized options as per the various requirements of clients. We have constructed state-of-the-art infrastructure that is equipped with all the required facilities to meet the requirements of our customers. We have segregated our infrastructure in various departments like designing, production, quality testing, etc. for carrying out different stages of the manufacturing process in an efficient manner. Due to our high production capacity, we are capable to meet the sudden and bulk requirements of our esteemed clients. Moreover, we regularly upgrade our infrastructural facility in order to carry out smooth production process. We strongly believe that a company can flourish and maintain the utmost position in the industry by having knowledgeable team of professionals. Our team of skilled personnel works in close co-ordination with the clients to maintain a steadfast supply of a qualitative range of products. Furthermore, their strong hold over the market and client needs make it possible for our organization to incorporate the required changes in the designs of our products. They also keep themselves updated as per the latest market trends in order to improve their skills and knowledge. High production of superior quality products is the prime objective of our company. The offered products are stringently tested on various parameters of quality in order to deliver flawless range at clients end. 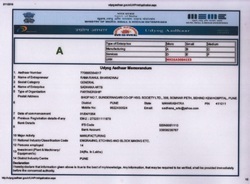 Also, we test the procured raw material on various parameters to ensure its high quality and longer service life. In order to attain the maximum satisfaction of clients, we offer the finest quality range of products. All our activities are directed towards satisfying clients by bringing forth a superlative variety of products. Due to this, we manufacture all the products in both standard and customized options. Our ethical business practices, timely delivery, competitive pricing policy, transparent dealings and wide distribution network help us attain the maximum satisfaction of our clients. Apart from this, we are also open to feedbacks given by our clients to improve our offered range. Under the motivating guidance of our mentor, Mr.Yashwant Athavale, we have acquired strong foothold in the industry. Due to his vast industry experience, we are able to meet the varied requirements of our clients in a timely and cost-effective manner. Manufacturing & Trading of Metal Name Plates. Mr.Yashwant V. Athavale was originally from Bhandara, Maharashtra. His father was a Doctor earlier in Indian Army then with Bhandara Jail. Mr. Y.V. Athavale came to Pune for education. 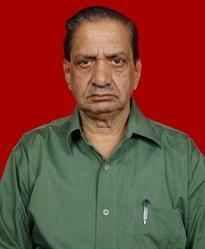 Become Graduate G.D.(Arts) in 1963 from Abhinav Kala Mahavidyalaya, affiliated J. J. School of Arts, Mumbai. Started working in printing industry first in " Asha Tin Printers" then in " Khadilkar Block Maker " then " Chitrashala Press " (Lithography) learning various processes required for Metal Labels Manufacturing. In 1964 Started ''M/S. Sadhana Arts'' along with 8 friends, himself being the brain behind this business, others being financial partners. In 1972 took over as proprietor and since then its growth is on the run. Since 1972 his wife Mrs. Vrunda Athavale, Graduate of Pune University, joined business and started Engraving section of Sadhana Arts leaving her job in Pune Telephones. In 1978 this engraving section was separated from Sadhana Arts & started as different entity as M/s. Yashawant Engravers. Since 1987 their daughter Ms. Madhavi ( Now Mrs. Rama Bharadwaj) Joined after giving 10th std. examination and learned Photo Typesetting while doing Graduation. After graduation started another sister concern, M/s. Sharp Typesetters in 1989 which later was merged with Sadhana Arts in 1995. In 1993 she was married to Mr. Rahul Bharadwaj, a Commerce Graduate with Management, Software & Hardware Engineering & Management diploma holder, who also joined business. Now looking after Marketing, production & overall Administration. on 1st April 2014 Due to age and ill health of both the proprietors of Sadhana Arts & Yashawant Engravers, the said proprietor concerns were made as Partnership by taking Mrs.Rama R. Bharadwaj ( Daughter) and Mr. Rahul J. Bharadwaj (Son-in-law) as Partners. On 24.02.2015 Mr. Y.V. Athavale expired at the age of 79 Years. Now the said businesses are looked after by remaining of the above mentioned 3 persons. Quality is the main and foremost motive of our organization and in order to maintain it in our products we use high quality Metal Sheets and advanced technology in the manufacturing process. Our team ensures that only premium grade factor inputs are employed in the manufacturing process. Furthermore, these products are well-tested on various parameters by our quality control mechanism to ensure their high quality. We also conduct periodic inspections and conduct various tests to make our product range flawless. In 1972 his wife of Mrs. Vrunda Athavale(Owner), graduate of Pune University, earlier working with Pune Telecom in overseas section, left job & joined the business in 1972 in Engraving Section. In 1978 this Engraving section was separated from Sadhana Arts and started as different entity by name M/S. Yashawant en Engravers. Our Sister Concern M/S. Yashawant en Engravesrs gives services of Engraving on aluminium anodized Labels, stainless steel, brass, copper, powder coated, silver, acrylic, Bakelite, plastics plates on flat bed machine. Since 1987, daughter of Mr. & Mrs. Athavale (Ms. Madhavi, now Mrs. Rama) joined after giving 10th standard examination and learned typesetting while doing graduation. After graduation started another sister concern, M/S. Sharp Typesetters in 1989 which later was merged with Sadhana Arts in 1995.
on 1st April 2014 Due to age and ill health of both the proprietors of Sadhana Arts & Yashawant Engravers, the said proprietary concerns were made as Partnership by taking Mrs.Rama R. Bharadwaj ( Daughter) and Mr. Rahul J. Bharadwaj (Son-in-law) as Partners. This business was looked after & carried forward by the Mentors Mr. Yashawant Athavale till he became unwell at his age of 78 years. He Expired on 24.02.2015. Now the said business is run by Mr & Mrs. Bharadwaj along with Mrs. Vrunda Athavale as consulting Partnerwho is 72 years of age. We are backed by a dexterous team of professionals who help in manufacturing and supplying superior quality range of products. The knowledge of our expert personnel and their in-depth knowledge help us in achieving the defined organizational goals like quality production and optimum client satisfaction. Their full dedication and commitment has enabled us to manage an invincible position in the industry. Moreover, they are also provided with regular training sessions and workshops in order to keep them abreast from the latest market trends. We have registered ourselves under Udyog Aadhar under MSME. We have emerged as a leading name in the domain of manufacturing, exporting and supplying superior quality range of Metal Name Plates, Metal Labels, Sign Boards etc. Also, we have established a widespread reputation for quality and integrity in the industry, with the support of our skilled professionals. 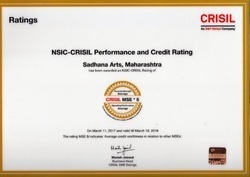 We have been Rated by CRISIL as MSE * 5 as per new norns of rating techniques.